Hi everyone, it’s Claire here from The Kitchy Kitchen. I looooooooove sushi. Love it. But since I’m well into my second trimester, I can’t enjoy classic sushi as often as I’d like. So instead of depressing choices like chicken teriyaki sushi rolls, I looked to vegan options that offer similar textures and colors as my favorite fish. All of these look adorable and taste even better. 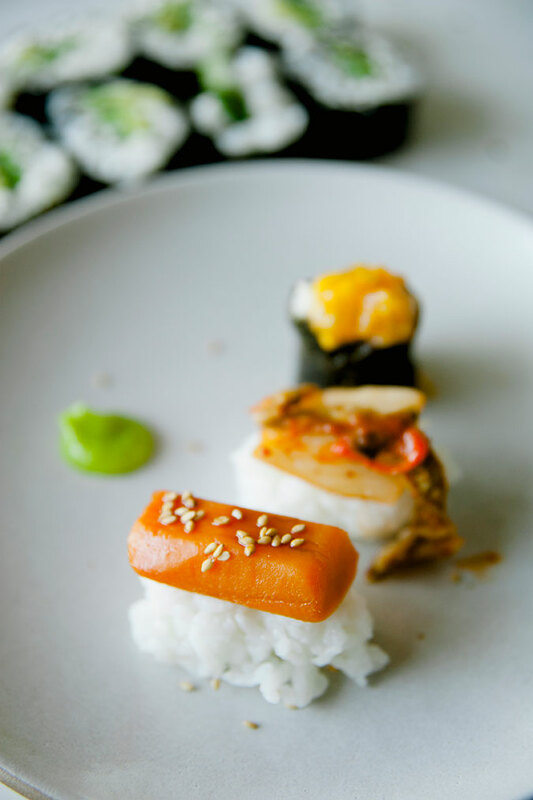 My favorite is the yam “uni,” which has a similar tender, melt in your mouth texture as uni, as well as that delicate sweetness. This is also a super fun project with kids, and you don’t have to worry about them handling raw fish. Enjoy! 1. Slice the yam into 1/3 inch slices, stack, and trim off the rounded edges. Cut into 1 x 2 inch rectangles (or as close as you can get). Place into boiling water for 5 minutes, until tender, and place in an ice bath to stop the cooking process. 2. Meanwhile, mix together the soy sauce, lemon juice, mirin, and rice vinegar in a small bowl. This is your ponzu sauce. 3. Moisten your hands with water. Take a tablespoon-sized oval of sushi rice and gently form it into a rectangle shape between the palms of your hands. If you squeeze it too much it will begin to lose its texture and shape, so don’t fuss and work quickly. 4. Hold a piece of yam in the palm of your left hand, and rest the rectangle of rice on top of it. Use your right hand’s thumb and index finger to gently squeeze the rice and yam into the rectangle shape while pressing down on the top of the rice with the thumb of your left hand. Flip the nigiri over so that the filet is on top and repeat the gentle squeezing process once more. Brush the yam with the ponzu sauce, and top with toasted sesame. 1. Moisten your hands with water. Take a tablespoon-sized oval of sushi rice and gently form it into a rectangle shape between the palms of your hands. If you squeeze it too much it will begin to lose its texture and shape, so don’t fuss and work quickly. Brush one side of the rice with a little wasabi. 2. 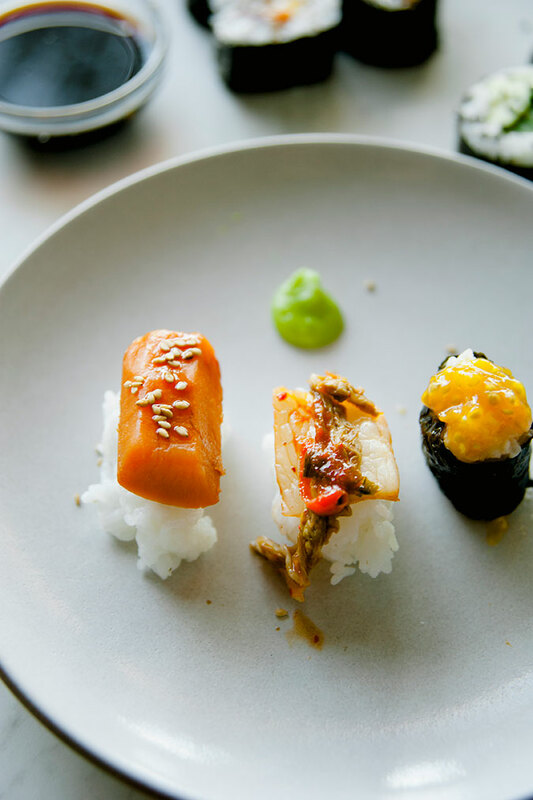 Hold a piece of kimchi in the palm of your left hand, and rest the rectangle of rice on top of the it, wasabi side down (so the wasabi is underneath the kimchi). Use your right hand’s thumb and index finger to gently squeeze the rice and kimchi into the rectangle shape while pressing down on the top of the rice with the thumb of your left hand. Flip the nigiri over so that the filet is on top and repeat the gentle squeezing process once more. 3. Brush the sushi with additional kimchi liquid, if it needs it. 1. Quarter the tomatoes and gently scoop out the seeds into a small bowl. These are your faux fish eggs. 2. Moisten your hands with water. Take a tablespoon-sized oval of sushi rice and form it into a square shape between the palms of your hands. If you squeeze it too much it will begin to lose its texture and shape, so don’t fuss and work quickly. Brush one side of the rice with a little wasabi. 3. Place the rice on a clean working surface. Dip your finger in the water and trace it onto the strip of nori to moisten it just a little bit so it sticks better to the rice. Attach one end of the nori to the middle of the side of the rice rectangle and keep wrapping it around until you’ve reached the end of the strip, keeping the bottom of the nori lined up the whole way. Dip your finger in water again and poke the end of the nori, then gently press it into the side of the sushi with your dry hand to seal it. 4. Gently place the tomato seeds on top of the rice, and brush with ponzu. 1. Place the nori dull side down on a bamboo sushi mat (the mat will make it much easier to form the roll). 2. 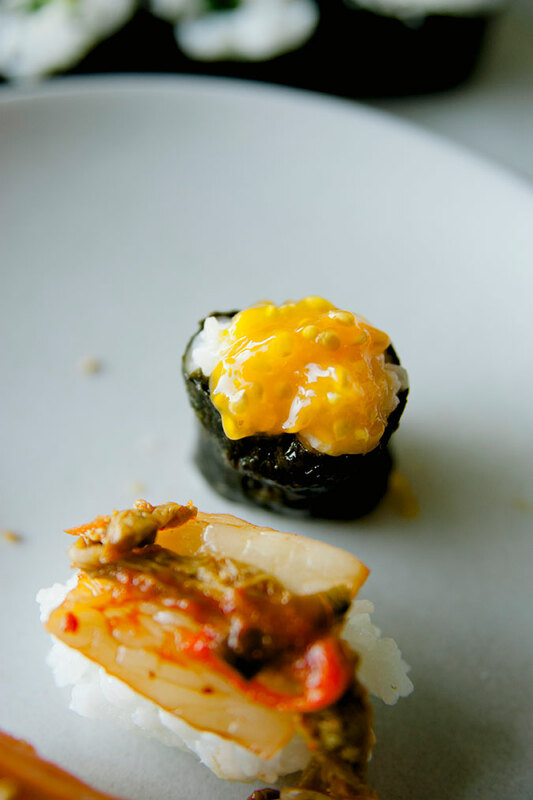 Delicately place the sushi rice onto the nori. It should only be about a 1/4-inch-thick layer, and not heavily packed. Leave a one inch margin at the top of the nori, this is where the sushi will seal itself. 3. In the center of the rice, lay each ingredient on top of one another. 4. 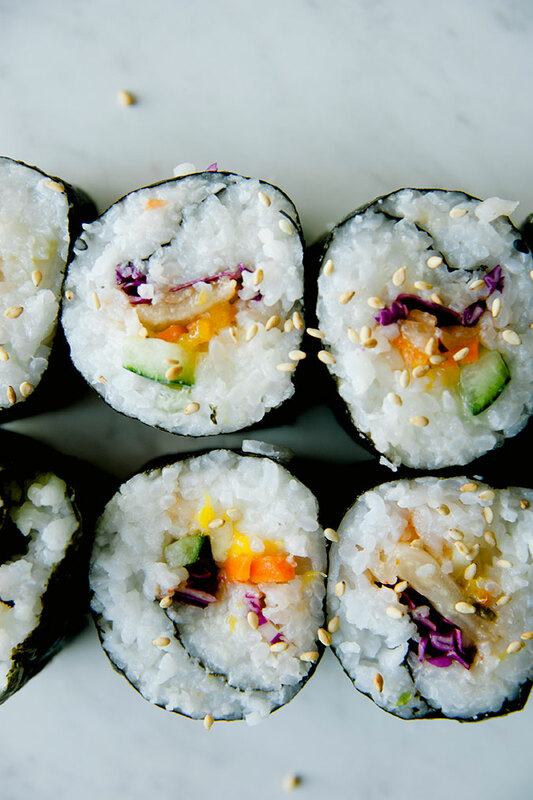 To form the sushi roll, lift the bottom edge of the mat, tuck in the ingredients, and roll once, squeezing the mat to secure the sushi. There should be a little rice and the margin of nori left. Continue rolling to form. If needed, brush the margin with a little water to help it seal. 5. With a very sharp knife, slice the roll into 1 inch pieces. Garnish with sesame and serve with soy sauce and wasabi. 1. Rinse the rice 5 times, then drain in a colander and let dry for 15 minutes. 2. Cook the rice in a rice cooker according to the manufacturer’s instructions. Alternatively, in a medium saucepan, combine the rice with 2 cups of cold water and bring to a boil over high heat. Cover and cook over moderate heat for 10 minutes. Reduce the heat to low and cook for 10 minutes longer. Remove from the heat and let stand, covered, for 15 minutes. 3. Meanwhile, in a small saucepan, combine the sake-mash vinegar, rice vinegar, sugar and salt and warm over moderate heat, stirring to dissolve the sugar. 4. Transfer the rice to a very large bowl. Sprinkle 1/2 cup of the seasoned vinegar all over the rice (drizzle onto a spatula while waving the spatula back and forth). Using a slicing motion with the spatula, gently separate the rice grains while mixing in the seasoning. Fan the rice while mixing it to help it dry. Wipe down any stray grains from the side of the bowl. Cover the rice with a damp towel to keep warm. And there you have it! 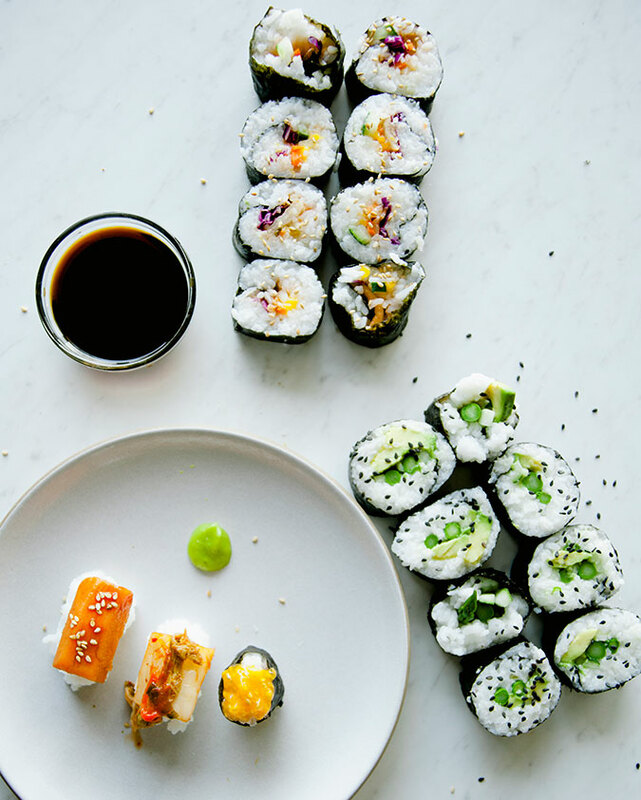 You now have a vegan sushi feast to dig into. 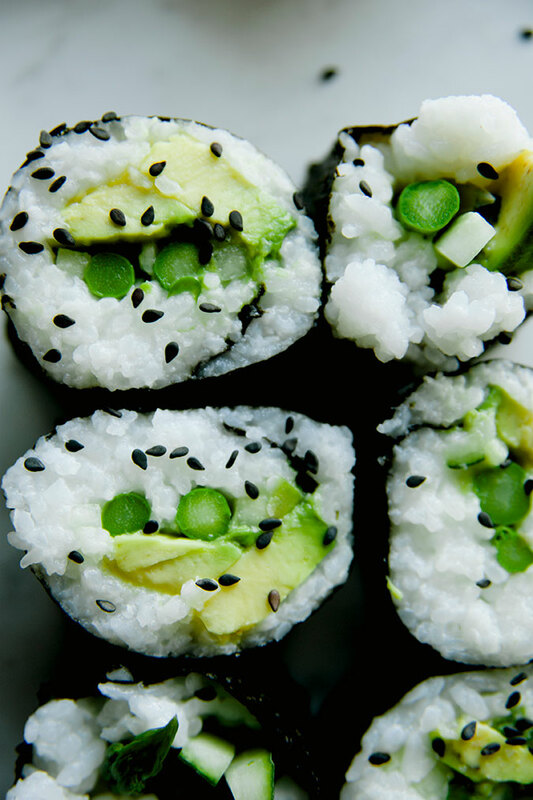 Will you be trying out any of these vegan sushi recipes? Let me know if you do in the comments!